Aylesbury FC squeaked through to the next round of the League Cup with a last-minute 1-0 win over AFC Dunstable on Tuesday evening. After the hurly burly of the league game between the two sides just three days earlier, it was an altogether calmer affair at Creasey Park. With the FA Trophy game at the weekend, manager Danny Gordon made seven changes in his starting line-up. There was a debut for striker Alan Musoke and Gordon himself partnered Mark Lambert at the back with James Faulkner returning to the starting line-up for the first time in six weeks and Jack Brooker replacing Ash Jenkins in goal. It was Dunstable that started the better with an early long range effort which flew straight at Brooker. Murphy also had a free-kick just outside the FC box which he fired over, and as the half continued, FC started to get more into the game with debutants Musoke and Dylan Cascoe causing Dunstable problems with their pace. On one of these raids, a ball over the top from Victor Ocansey was chased down by Musoke and his cross eventually found Faulkner who slotted home, but the linesman had already flagged for offside. On 35 minutes came the best chance of the half. FC were awarded a free kick on the right edge of the box and Ocansey’s delivery found Danny Gordon in the area but his diving header was saved by the Dunstable keeper. 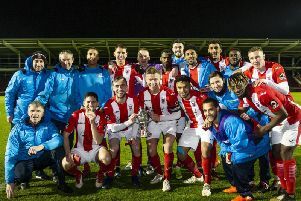 The home side were still dangerous and Jack Brooker had to turn a half volley from Roy Byron round the post as the half came to an end, and there was still time for another move down the right involving Georges Ehui and Dylan Cascoe which ended with Cascoe firing just wide. Dunstable started brightly in the second half and just a minute in Brandon Carney clipped a ball just over the Aylesbury bar. Carney was also starting to get more into the game and he flashed in another ball which evaded everybody in the Aylesbury box. The game appeared to be moving towards a penalty shoot-out when, with the clock running down, a through ball was latched onto by Jonny Montgomery, who was still some 30 yards out. Montgomery outpaced both defenders, took the ball round the stranded keeper and slotted in for an excellent victory.